While every nursery and greenhouse carries a lot of ornamental and landscape plants, not very many specialize in food plants, except for the spring garden season, so a nursery that focuses on plants that can feed people can fill an important gap in the market. If you enjoy growing edible and food-producing plants, and empowering more people to grow their own food, then starting a food plant nursery might be the green business idea for you. 1. What is a food plant nursery? Nurseries grow and sell plants at a variety of life stages, but most of the plants sold at a conventional plant nursery are for their ornamental features, to enhance a landscape or yard. A sustainable food plant nursery focuses on growing and selling organic annuals, biannuals, perennials, shrubs, and trees that all produce food. The results of a business like this are nothing short of revolutionary. A food plant nursery empowers people in your community to produce their own food. It teaches children that food does not come from a supermarket. It reduces the number of miles our food travels from ‘farm to plate’ and the amount of fuel used to make that happen. It creates community by fostering interaction between neighbors who may trade produce with each other as it comes in seasonally. It reduces the amount of chemicals used in agriculture. It capitalizes on a great deal of wasted space many people have in their yards, on their balconies, or on their windowsills. A food plant nursery reintroduces local plants, including heirloom varieties, that ensure diversity of our food supply. 2. What required knowledge or skills are necessary to start a food plant nursery? Knowledge of growing, potting, and gardening are all essential for this business to succeed, however, there are no formal educational or training requirements for this job. The work can be strenuous and requires that the worker be able to be on their feet for extended periods of time, to be able to work out in the elements, to be well-organized, to be a good ‘people person’, and be able to lift up to 50 pounds. Knowing what types of food plants are appropriate for your region is a huge plus for running a food plant nursery, as is knowing which seasons are best for starting and growing different types of food plants (hot season vegetables vs. cold season vegetables, for example). A food plant nursery owner will have to be good at scheduling seeding and potting activities well in advance, because their customers will be looking for plants that are ready to put in the ground when they are ready to start their garden. $ (on a scale of $ to $$$$$) While this business can be started on a table in front of a sunny window, a greenhouse or coldframe is needed in order to produce more food plant starts during early spring when the weather is colder, and to grow enough plants to make it financially viable. A good assortment of planting pots, from trays to six-packs to larger pots, will need to be purchased, and unless you’ve already got a good system for making your own potting soil, an investment in a good quality potting mix is also required. For small scale food plant nurseries, hand-watering will work, but for larger nurseries, an automatic watering system might be the only feasible method for daily watering needs. $$ (on a scale of $ to $$$$$) The income potential for a food plant nursery depends a lot on the volume of plants that can be grown and sold, so a small operation may be limited, unless it is focused on a specific, higher-value, niche (hard-to-grow herbs, perennials, vines, fruit trees, etc.). Another limiting factor can be the absence of a visible retail outlet for the business, as while you can sell your plant starts directly from home, from your garage or backyard, you may not have the same reach as if you sign up for a table at the farmers market, or contract with a local grocery store or home improvement center to supply them with plants. 5. What is the best location for a food plant nursery? Urban (good), semi-urban (best), suburbs (very good), rural (poor). 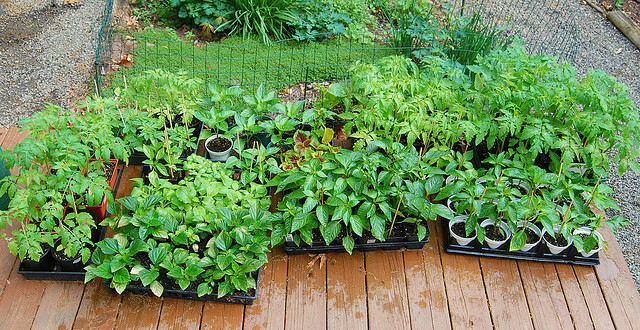 You’ll need space in which to grow your seedlings, and access to a pretty sophisticated irrigation system, so it is best to start this business where real estate is not too expensive, yet close enough to most of the markets where you can sell your items (think about transporting a thousand seedlings… you won’t want to go too far). Do you enjoy introducing new food plants to people? Are you in a position where you can start a business that might take 10-20 hours per week and not pay very much, at least to begin with?